How does the altered perspective change the feeling and sensibility of the scene? Do you think these are purposeful, simple mistakes or negligence? Does the altered perspective make this better or worse and in what way? What is isometric projection and where is it here? Additionally for this discussion, find an artwork that has some errors in the perspective (large or small) through a web search. Paste the url into the discussion thread below and answer the same questions. Giorgio de Chirico once said, “To become truly immortal, a work of art must escape all human limits: logic and common sense will only interfere. 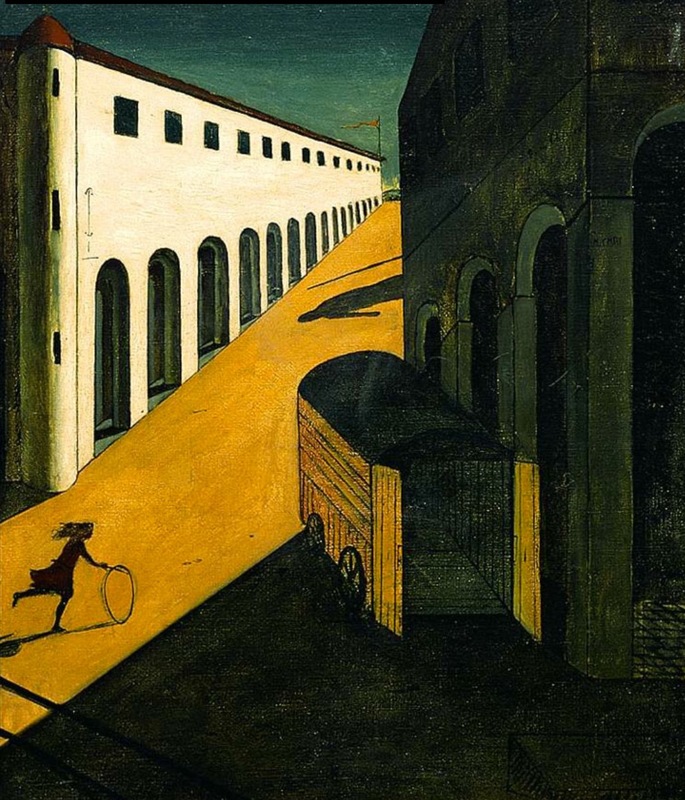 But once these barriers are broken, it will enter the realms of childhood visions and dreams.” This philosophy is reflected in his painting Mystery and Melancholy of a Street: the composition deliberately and repeatedly breaks the rules of perspective (de Chirico was capable of depicting correct perspective, see his uncharacteristic “Still Life with Silver Ware”), which contributes to an unsettling, dreamlike atmosphere that characterizes his main body of work. Isometric projection is a technique used for drawing three-dimensional geometric forms, where the angles of the form between the projection of the axes equal 120 degrees. I believe isometric projection is used here for the form of the vehicle. 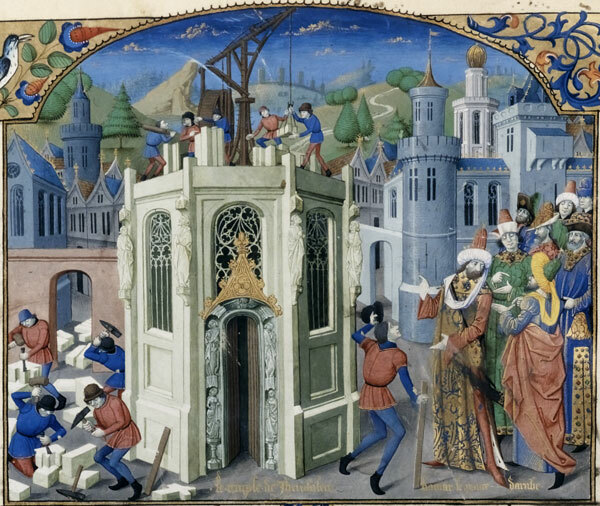 The unfinished castle in the middle seems to be at two different distances; it seems close enough that a worker can prop up a board against the wall by him, and yet the door and the workers on the top of the structure are too small for that distance. There’s also the matter of how the castle on the right-hand side of the painting is too low in the composition for its distance away from the viewer, and as a result, the richly-dressed men seem to be taller than two stories of the castle. Despite this, I can’t say that this “ruins” the painting, either; it has an earnest, unpolished charm of its own. 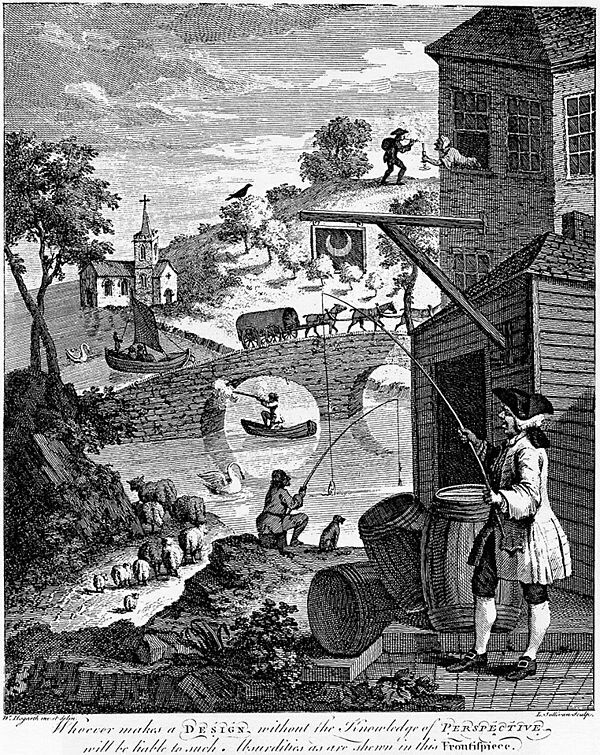 A classmate posted a humorous work by Hogarth:William Hogarth’s intentions for the second image were to accompany a friend’s pamphlet on linear perspective. The image is crowded with as many deliberate perspective mistakes as possible: tiles skewing away from the vanishing point, sheep growing larger into the distance, the sign obscured by the trees in the background, etc. Here’s a paper I wrote on Max Ernst for Composition last quarter. I’m glad that I’m in art school so that at least I can write about artists or art pieces for required English classes! Max Ernst was a prolific and tirelessly innovative artist who was driven to disrupt artistic conventions because of a desire to explore creativity and his subconscious. Ernst had several powerful experiences as a child and as a veteran of World War I that profoundly impacted the subject and techniques of his work. When he was at the age of about five to seven, Ernst experienced a burst of pareidolic hallucinations in a panel painted to look like mahogany, which he vividly described in his autobiography: “menacing eye, long nose, great head of a bird with thick black hair.” Ernst described another influential experience that came at the age of fifteen; one morning, Ernst discovered that his pink cockatoo, which he had considered one of his best friends, had died in the night. At the same time, Ernst’s father suddenly announced the birth of a sister. The combined emotional impact of the events was such that the young Ernst straight-up fainted, and experienced a series of “mystical crises, fits of hysteria, exaltations, and depressions” for some time afterwards. This event led to what he described as “a dangerous confusion between birds and humans”, which manifested itself through the frequent appearance of bird-human hybrid characters in his artwork, as well as through his use of a bird character named Loplop as a persona. In 1914, World War I broke out, and Ernst was drafted as an artilleryman. During his service, his first wife Luise observed that Max sometimes retreated into himself and spoke little, and his eyes could look “very hard”. At this time, Ernst’s paintings and drawings were more Expressionist in style, and tended to include nervous, unsettled distortions of perspective and anatomy. A rebelling art movement seemed like a natural reaction against the senselessness of the war and pro-war culture. Ernst was influenced by his friend Alfred Grunewald to to engage in acts of social protest and provocation in collaboration with the other Dadaists, such as disrupting a militarist art show, or creating performance art that involved rude or otherwise confronting displays. 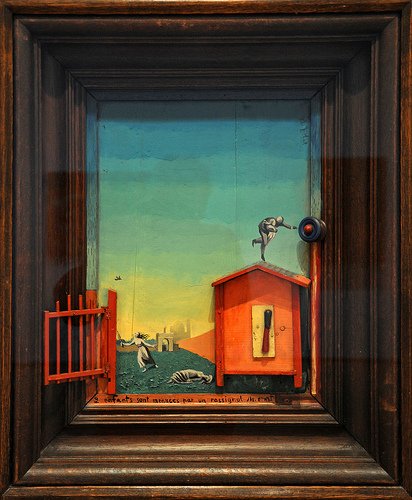 In one display that was Ernst’s own invention, the visitors were encouraged to damage a block of wood with an axe in order to best appreciate the artwork. It was during this period of Dadaist activity that Ernst began developing his own personal style of collage. While other prominent collage artists such as Pablo Picasso and Kurt Schwitters used collage in more abstract, texture-focused ways, Ernst took sources such as old catalogues, scientific journals, and illustrated Victorian novels, and recombined them in order to create characters and environments of his own. Eventually, Ernst explored other techniques of creating artworks out of found imagery. One of his favorites was decalcomania, which involved placing paint on a surface, smearing the paint using paper or glass, then incorporating the naturally-smeared paint into the foundations of a painting. Examples include The Antipope, The Stolen Mirror, and Europe After the Rain. Another technique was frottage, where he used rubbings of grained wood as the basis of drawings. Ernst recalled his first experience with frottage while he was in a guesthouse by the sea: “I was struck by the obvious interest my eyes seemed to be taking in the floor, the grooves of which seemed to have been accentuated by a thousand washes. I decided then to interrogate the symbolism of this obsession, and to come to the assistance of my meditative and hallucinatory qualities, I obtained from the planks a series of drawings, by placing sheets of paper over them at random which I set about rubbing with graphite.” For Ernst, both techniques were ways of making artwork with the direct involvement of his subconscious. Max Ernst was a sensitive artist who created autobiographical artworks that allowed him to work through his experiences as well as lead him to a deeper understanding of himself. By studying the works, techniques, and life history of Ernst, it is possible to have a deeper understanding of how artistic expression can be beneficial and enlightening. Brodskaïa, Nathalia. Surrealism: Genesis of a Revolution. New York: Parkstone International, 2012. A book that discusses the surrealist movement, with seven chapters devoted to seven prominent artists associated with the movement: Max Ernst, Yves Tanguy, Joan Miró, André Masson, Rene Magritte, Salvador Dalí, and Paul Delvaux. Each of the seven chapters examines the life and career of the artist in question, including significant events and experiences from their childhood and their relationships with the surrealist movement. Camfield, William A. Max Ernst: Dada and the Dawn of Surrealism. San Francisco: Wittenborn Art Books, 1993. A book which includes eight in-depth scholarly essays by William Camfield on the Dadaist movement and Max Ernst’s life and career, supported with quotes from his autobiographical writings, and accompanied by black-and-white and color plates of his artwork and scans of found imagery that he incorporated into his collages or used as inspiration for paintings. Topics discussed in detail include Ernst’s childhood hallucinations, the childhood coincidence of his pink cockatoo dying and his sister being born that led to a preoccupation with birds found in his artwork, his experiences serving in the 23rd Artillery Regiment of the Rhine in World War I, and his introduction to and participation in the Dadaist and Surrealist movements. Nolan, Stuart. “The enduring significance of the work of Max Ernst.” World Socialist Web Site. October 1, 1998. http://www.wsws.org/en/articles/1998/10/erns-o01.html. (accessed March 4, 2015). A fairly lengthy article which, citing Ernst’s own writings, touches on several important aspects of Ernst’s life and work. Topics include the influence of World War I on his artwork, his attempts to understand the nature of creative thought, the inspiration behind his collage style, the influence of his artwork on Andre Breton, and the influence of Leonardo da Vinci’s use of pareidolic techniques on his own work. William A. Camfield, Max Ernst: Dada and the Dawn of Surrealism (San Francisco: Wittenborn Art Books, 1993), 33. Nathalia Brodskaïa, Surrealism: Genesis of a Revolution (New York: Parkstone International, 2012), 83. Stuart Nolan, “The enduring significance of the work of Max Ernst,” World Socialist Web Site, October 1, 1998, http://www.wsws.org/en/articles/1998/10/erns-o01.html. René Magritte’s 1947 painting Le Liberateur is a bold depiction of the subconscious mind. The subject of this painting (fig. 1) is a seated figure wearing a straw hat, a bright red shawl, a neatly-tailored pair of trousers, and a pair of black leather shoes. His head and torso have been replaced with a card or parchment with 4 silhouettes on it, similar to the traditional “4 of clubs” design: a key, a goblet, a dove or pigeon in flight, and a tobacco pipe. His left hand rests on the handle of a bamboo cane; his right hand carries a strange object consisting of an elaborate, symmetrical, pearl-inlaid structure which has the eyes and mouth of a beautiful woman, attached to a large grey base similar to the base of a candelabra. The man rests on a rock formation by a dirt path, and a standard brown leather suitcase lies on the ground by his right foot. Behind the figure is a lush, wooded landscape with a winding river. In the upper half of the painting, the sky is fragmented into numerous blocky arches, which retain the colors and gradient of a daytime sky. Cumulus clouds of various sizes drift through the arches. Behind the arches, a starry night sky is visible, yet the lighting on the other elements in the painting (the background, the figure, etc.) comes from the sunlit sky seen on the arches. At first glance, the painting might seem completely absurd or nonsensical. The viewer is treated to multiple unexplained images that are at once familiar and unfamiliar. Human figures are combined with inanimate objects, the sky is at once daytime and nighttime, and seemingly unrelated visual signifiers are combined in ways that suggest relationships. To better understand Le Liberateur, and Magritte’s work in general, it is important to recognize that painting was made at a time when society was increasingly influenced by the neurologist Sigmund Freud’s theories of the subconscious. René Magritte was a member of the Surrealist movement, a group of artists and intellectuals, founded by André Breton, who wished to explore how the mind could be trained into new forms of creativity. Attempting to represent the workings of the subconscious presents unique challenges, as the subconscious is, by definition, not consciously perceived. Magritte used several visual tactics in order to represent the subconscious. One tactic is the use of recurring imagery. Several of the specific combinations of imagery in Le Liberateur turn up in other Magritte paintings; variations of the central figure are the focus of Magritte’s Le Therapeute series of paintings,  while the pearly face is the subject of his Scheherazade series of paintings,   and appears in his 1947 painting Les Grands Rendez-vous, which also contains the same four symbols as seen on the “body” of the central figure in Le Liberateur. Other recurring images are less specific, and occur in many different permutations throughout Magritte’s work: doves/pigeons (e.g. Clairvoyance (1936), Le Retour (1940), Night of Love (1947), Man in a Bowler Hat (1964), etc. ), tobacco pipes (e.g. La Lampe Philosophique (1936), La Trahison des Images (1948), The Cripple (c. 1948), La Bonne Foi (1965), etc.) and cumulus clouds in blue skies (e.g. Le Faux Miroir (1928), Megalomania (1948), Les Valeurs Personnelles (1952), Decalcomania (1966), etc.). The combinations of the seemingly unrelated familiar objects also evokes the workings of the subconscious mind; it illustrates how it is able to form connections between concepts and events that are not immediately obvious to the conscious mind. In closing, I feel that Magritte was at least partially successful in conveying how the subconscious mind can affect our understanding of reality. 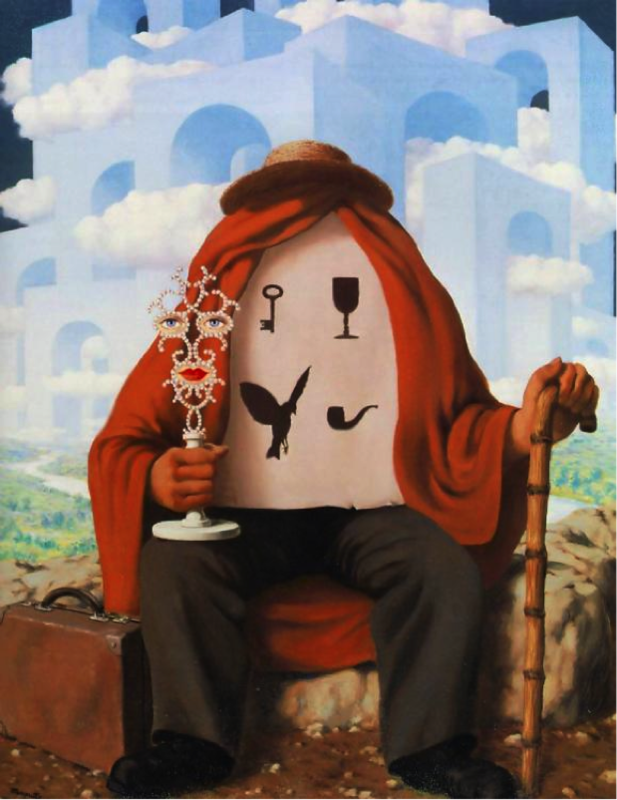 Examining Magritte’s work in detail encouraged me to think about how the subconscious mind can form complex connections between various life experiences. And, in keeping with the original mission of the Surrealists, it made me consider how I can harness my subconscious mind to help fuel my conscious creativity. Author unknown, “Les grands rendez-vous: René Magritte Auction,” Artnet, date last modified unknown, http://www.artnet.com/artists/ren%C3%A9-magritte/les-grands- rendez-vous-qU09Ypet55WMizD8Rrvn3g2. Learning to use a pen tool yesterday. 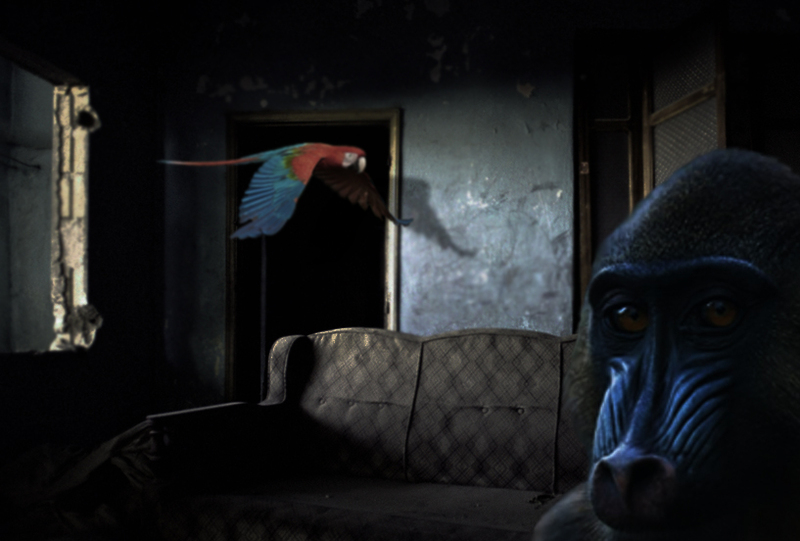 Here’s Mandrill and Parrot in Abandoned House.